Put on my new plastic glove. With a little slice of love. Down here in Lunchlady Land. The song "Lunchlady Land" appeared on Sandler's first comedy album "They're All Gonna Laugh at You" in 1993, but it was the dancing Farley dressed up as a stereotypical cafeteria worker on Saturday Night Live in 1994 that brought the song to the masses. It resonated with people because every American remembers the school cafeteria workers and the food they served. 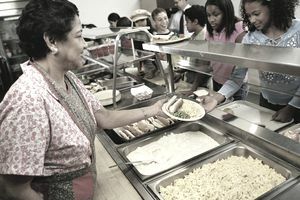 Cafeteria workers serve breakfast and lunch to school children during the school year and sometimes during the summer when federal programs fund meals for children in economically disadvantaged families. It is a good job for people who want to interact with children but do not have the desire to teach. School cafeteria workers are hired through the normal government hiring process. Jobs are posted to each school district’s website. Candidates complete application forms, and finalists participate in the interview process. The position does not require any experience and rarely requires more than a high school diploma. The selection process is not rigorous. However, background checks are often conducted on finalists because they have access to children. A high school diploma is sometimes required for school cafeteria worker jobs, but often, that is not even required. New hires must be old enough to work and are hardly ever young enough to be typical-age high school students. Even though a 16-year-old can work, one is highly unlikely to be employed in a school cafeteria. Such a student would have to drop out of school and then return to a school setting to work. Consequently, cafeteria workers are at least 18 years old. Experience is not needed for cafeteria worker jobs. Previous employment in the restaurant industry is helpful but not necessary. On-the-job training is sufficient to prepare a new hire for the job’s daily tasks. School cafeteria workers are just one of the many groups of people that contribute to children’s educations. They work alongside teachers, coaches, counselors, librarians and other school personnel to help children get the most out of their school years. Nutritionists, dieticians and other appropriately trained staff plan menus for school children's meals. These menus must meet rigorous nutrition standards. Cafeteria managers make sure cafeteria workers have the food and supplies they need to serve all the items on the menus. Cafeteria workers frequently check their inventory of food and supplies so they can alert their managers when they notice that they might not have what they need. Doing this requires moving heavy boxes and equipment. Cafeteria workers wear protective clothing such as plastic gloves and hairnets. Not only is it gross to find a hair in the gravy, but it is also unsanitary. As cafeteria workers prepare food, they must be diligent about food safety. In younger children, foodborne illnesses can be fatal. Cafeteria workers avoid cross-contaminating food. For example, they change their gloves between handling raw meat or poultry and handling vegetables. They ensure kitchen equipment, food preparation spaces and dining rooms are routinely cleaned. Cafeteria workers often perform cashier duties. They take the children’s payments for breakfasts and lunches and make changes as appropriate. They must be aware of which children receive government-subsidized free or reduced-price meals. Cafeteria workers keep this information confidential to keep other children from having ammunition to taunt, tease or bully those children who receive those government benefits. Cafeteria workers are paid anywhere from $9 to $16 per hour. If they work a full-time schedule, they likely receive a better than average benefits package. Part-time workers may receive benefits as well, but some benefits may be prorated on the basis of how many hours per week they work. What Does a Sanitation Worker Do?